There are many disadvantages of on-road cycle-lanes vs. off-road cycle-paths. This was well illustrated today when cycling along a road with a cycle-lane on one side and a cycle-path on the other. Cyclists using the on-road lane suffered from that lane being halved in effective width from the usual 2.1 m to about 1 m due to swept snow filling half the lane. This pushed those cyclists closer to passing motorized traffic. On the other side of the same road cycling was as safe as usual because the off-road path required sweeping separately from the road and therefore remained close to its usual 2.5 m width. This road in Assen has an on-road cycle-lane on one side but an off-road cycle-path on the other. Though the separation between the off-road path and the road is narrower than is ideal, this kerb requires that the snow plough driver properly on the cycle-path and cyclists remain properly separated from the traffic on the road. Cyclists travelling in the opposite direction, using the on-road lane, found themselves pushed closer to motorised traffic. In another location you can see how clearance of this cycle-path was not perfect because the width of the snow plough used was less than the width of the path. However, this still left a perfectly usable bidirectional path which still served to provide cyclists with safer conditions separated from the road alongside which carries motorized traffic. A few days after the other photos were taken. The temperature has remained below zero for several days now. All the trees are white, covered in frost, and the canal is frozen. 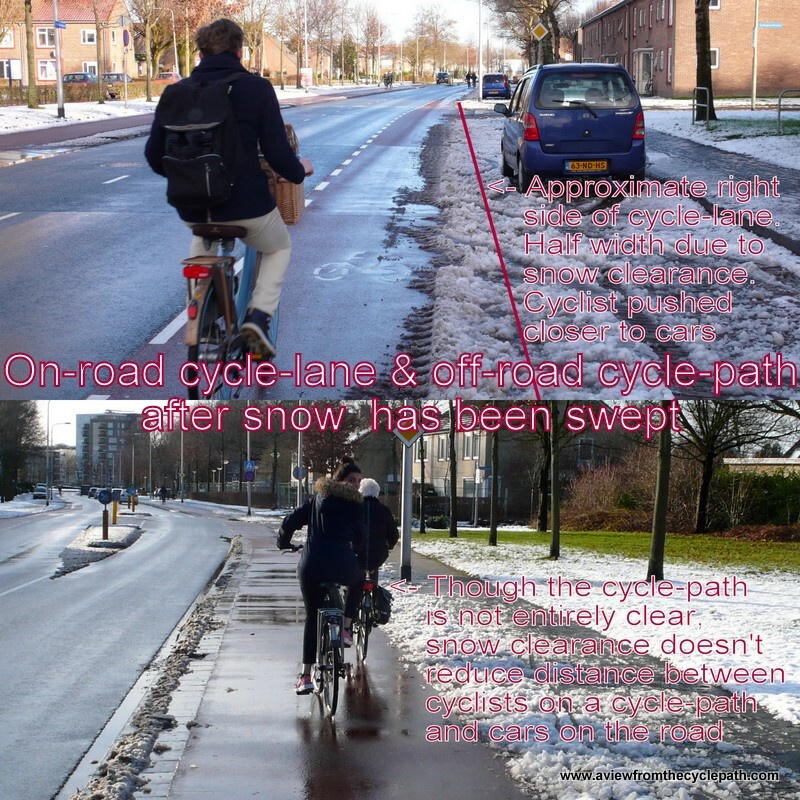 The cycle-paths are mostly clear. Wide paths like this, which is 4 m wide, don't tend to be clear to their full width because the snow ploughs are less than 4 m wide. The road at the top also features in blog posts about two other potential problems with on-road cycle-lanes: Dooring and pinch points. In both cases this road provides relatively good examples of relieving these problems, though an off-road cycle-path is generally a better solution. Also see a blog post summarising all problems with on-road cycle-lanes. For positive infrastructure ideas, see all blog posts about good design. Support this blog. Buy products for winter cycling from our webshop. We use studded tyres on our bikes to greatly reduce the chance of falling. Hi, I really enjoy reading your blog. I hope you post again soon. I am tempted to move to NL purely for the cycle infrastructure! I'm so upset I had to share some pictures although I'm sure you're already aware of what you're not missing out on! It's deeply frustrating here in Dublin. The bike culture and planning intent is similar to the UK, but without even less funding available. So they have used some very creative approaches. It's not that I don't want sympathy! But seriously, these "concessions" are frankly insulting. There is clearly a huge pent-up demand for cycling here; there are many cyclists despite this ridiculous road layout, and bikes locked to inappropriate street furniture everywhere. I'd imagine the solutions would be similar as to the UK. Please, if you have any idea, what can I do as an individual? It seems people have no imagination/expectation, but your blog has inspired me to demand better. However, in the absence of external shock (such as huge increases in oil prices) I wonder if change is even possible, as the status quo is so entrenched.